Wacky witches and mischievous elves will soon be descending upon Cutting Hall Performing Arts Center as Family Friendly Theatre presents “A Night at the Costume Ball” on Monday, October 8 and Tuesday, October 9. Palatine Park District’s Family Friendly Theatre productions offer a convenient local option for introducing children ages 3-12 to the theatrical experience. The two 60-minute performances will be held at 10:30am on both days when District 15 will not be in session. 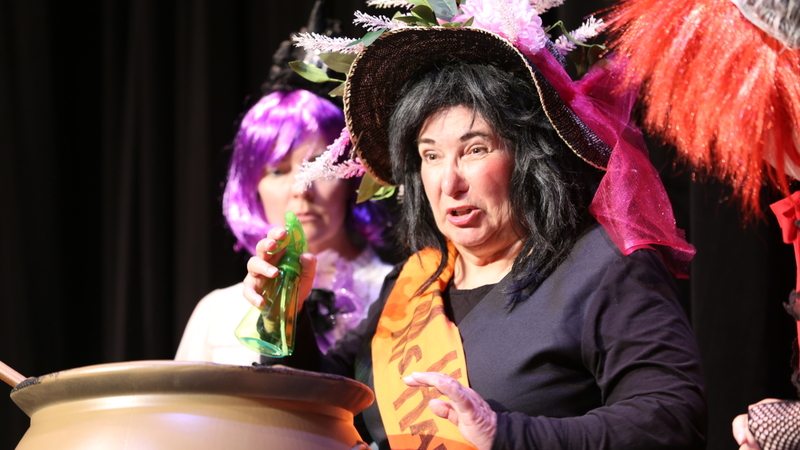 “A Night at the Costume Ball” is an original production that features the antics of three witches, their “level- headed” broom, and some impish elves who have decided to attend Frankenstein’s annual costume ball with their sights set on winning the first-place prize. The show, book, and lyrics are written by Sue Mrotek, arranged by AJ Braman, and directed by Julie Price. Cast members include Sue Mrotek of Mundelein, Eileen Mitchell, Julie Price, Madeline Frankin, and Susan Mulert of Palatine, Marcy Angsurat of Sleepy Hollow, Linda Browne of West Dundee, Nancy Braus of Schuamburg, and Jennifer McHugh of Deer Park. All 2018 Family Friendly Theatre performances are sponsored by Andigo Credit Union in Schaumburg. “Andigo Credit Union is proud to be sponsoring ‘A Night at the Costume Ball,’” said Julie Selof, Andigo Community Relationship Manager. “Founded in 1939, Andigo is not-for-profit financial institution and offers all the services of a bank, without the bummer,” she added. Open to the community, Andigo has a branch in Schaumburg on Meacham Road across from Costco, and recently opened their newest branch in Carol Stream. Ticket prices are $6.00 per person (individuals) and $5.00 per person (groups of 10 or more). To purchase tickets online, visit cuttinghall.org or call 847.202.5222 for more performance information. Additional ticketing fees may apply. Bring the family or bring a group to enjoy these zany characters as they sing and dance their way to the ball. Audience participation and costumes are encouraged. For more information about Palatine Park District’s Family Friendly Theatre program or to book a private group performance, contact Cultural Arts Coordinator Ashley Schiavone at 847.496.6237 or aschiavone@palatineparks.org.